Neeraj recorded his overall best performance as the 20-year old registered a remarkable attempt of 86.47 metres in the final. While Neeraj finished top of the podium with his season best performance, Hamish Peacock of Australia came second with his 82.59m attempt. Indian track and field athlete Neeraj Chopra entered his name in the history books on Saturday after becoming the first Indian javelin thrower to win a gold medal in the ongoing Commonwealth Games at Gold Coast. Neeraj recorded his overall best performance as the 20-year old registered a remarkable attempt of 86.47 metres in the final. While Neeraj finished top of the podium with his season best performance, Hamish Peacock of Australia came second with his 82.59m attempt. The Australian was followed by Anderson Peters, who came third with a decent 82.20. Neeraj’s counterpart in the Indian javelin contingent — Vipin Kashana, who was another favourite to finish top three came fifth with an attempt of 77.87m. Starting the proceedings of his bid to finish at top of the podium, Neeraj recorded in at 85.50m as his first attempt while his second was a foul. The Indian javelin thrower then registered 84.78m mark in his next attempt before embarking the gold medal clinching total in his fourth attempt. Neeraj’s fifth try was recorded at distance of 83.48m. which was followed by his invalid sixth and final attempt. 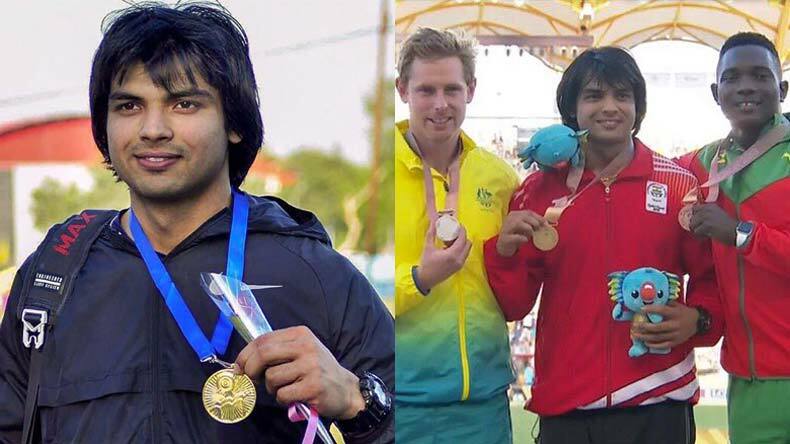 Neeraj Chopra was praised by social media for his historic feat at Gold Coast. “Delighted to know that Neeraj Chopra has won GOLD in Men’s Javelin Throw at #GC2018Athletics Many congratulations,” President of India—Ram Nath Kovind tweeted. “Neeraj Chopra, the farmer’s son from Khandra village in Haryana’s Panipat, never had a formal javelin coach growing up, learned watching videos on YouTube, a gold medal winner at the #CWG2018 he wins with a throw of 86.47m! Congratulations 👏🏼👏🏼👏🏼,” actor Sai Dharam Tej tweeted.